This recipe originally appeared on my first blog, Amy's Cooking Adventures, in June 2012. Chocolate and peanut butter are a match made in heaven. 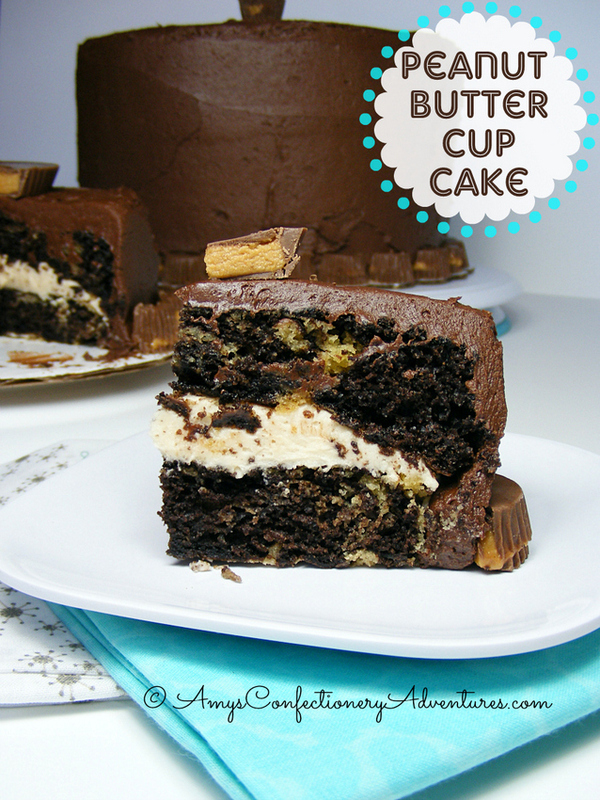 Peanut Butter Cup candies are obviously fantastic, so the whole idea translated to cake is amazing! Three people in a row just asked me to make them peanut butter cup cakes for various occasions! Need a little chocolate and peanut butter in your life? Here’s the recipe! This recipe originally appeared on my first blog, Amy's Cooking Adventures, in March 2011. With the warm weather and Memorial Day coming up this weekend, I am starting to dream about S’mores! 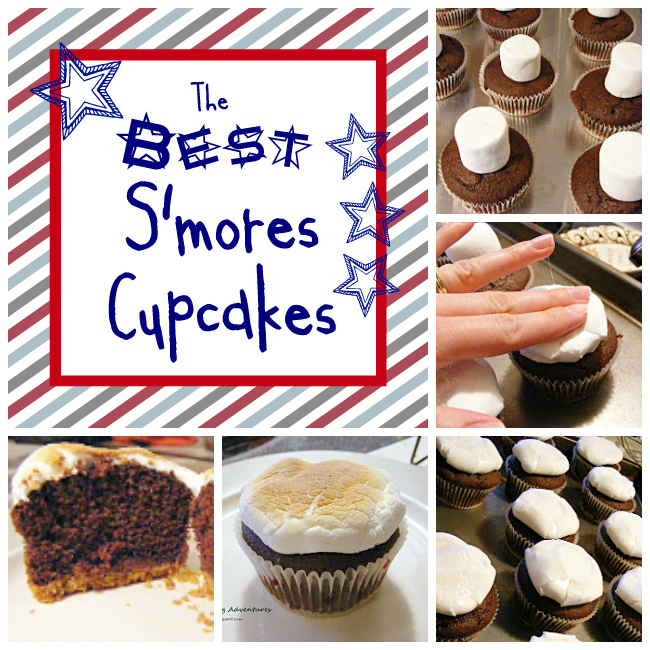 I pretty much love S’mores in any way, shape, or form, so today I’m sharing a simple and delicious S’more Cupcake! With chocolate, graham crackers, and ooey gooey mashmallows, you can just never go wrong! This year, I get to make cakes for 3 graduates! The first one was for a collage graduation last weekend. 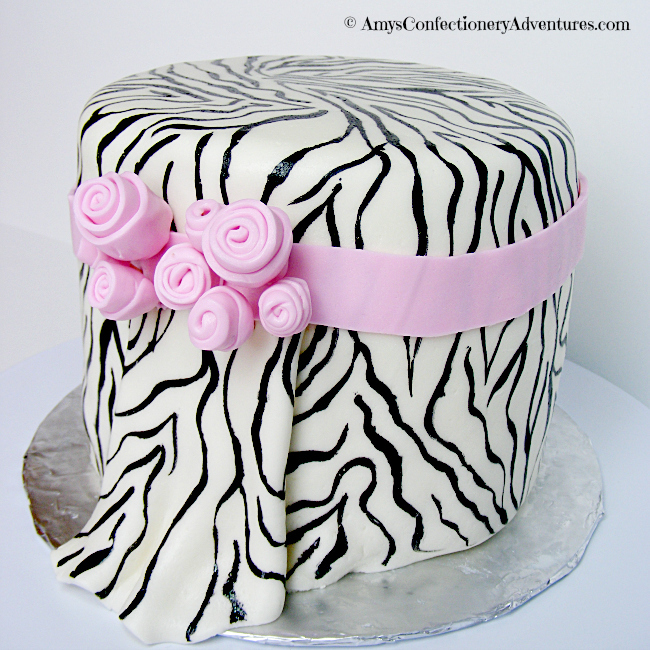 She didn’t want anything that screamed graduation, so we went with a small zebra striped cake! This cake originally appeared on my first blog, Amy's Cooking Adventures, in September 2011. They seem like they’d be so simple, yet they can go wrong, so quickly. Just do a little google search, you’ll see what I mean. So when I was asked to make a Lego cake for an 8-year old’s birthday, I was nervous! Lego’s are so iconic – I didn’t want to mess it up! The solution came in the form of a silicone candy mold! I kept the cake itself simple and clean and then decorated it with candy Legos! It was the perfect solution for a little boy’s Lego cake! I share a lot of cakes over here. And while they all have a few imperfections, I consider them successful. For whatever reason, my bottom layer crumbled, and the whole thing started to tip! 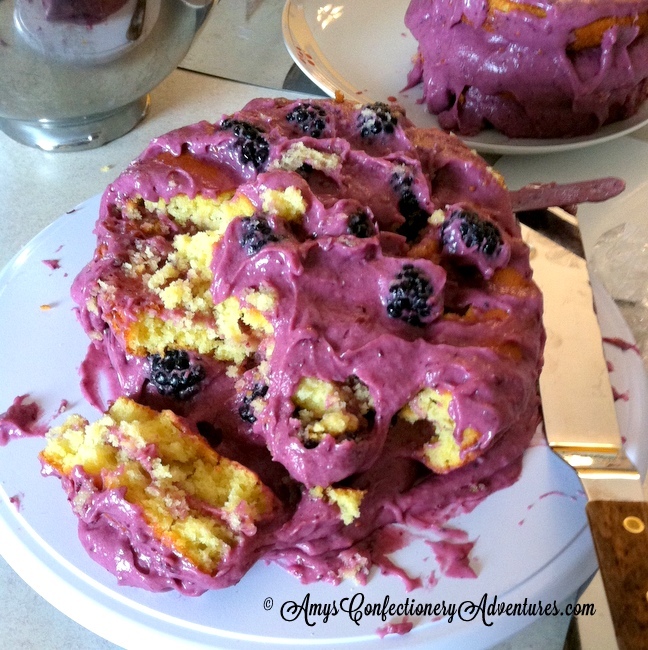 I think, perhaps, that I put too much blackberry puree into my frosting. The frosting was a little on the runny side and I think it just couldn’t hold up the cake! I was able to salvage the top three layers, and well, the rest was put in mason jars and sent to the neighbors as a treat (it was still delicious after all, just a bit crumbly). Despite the difficulty and the runny frosting, the mini cake was delicious! 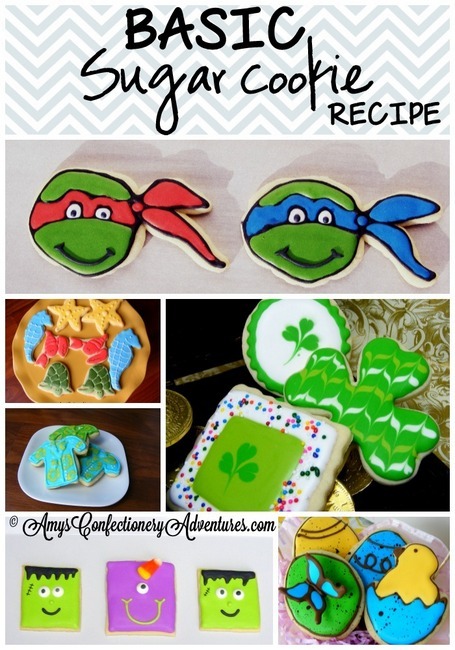 This post originally appeared on my first blog, Amy's Cooking Adventures, in May 2011. Since my husband was out of town on Mother’s Day (2011), I decided to host a Mother’s Day Tea at my house for my Mommy friends in the same situation. For the tea, I knew I wanted to have something fun and pink and super feminine. 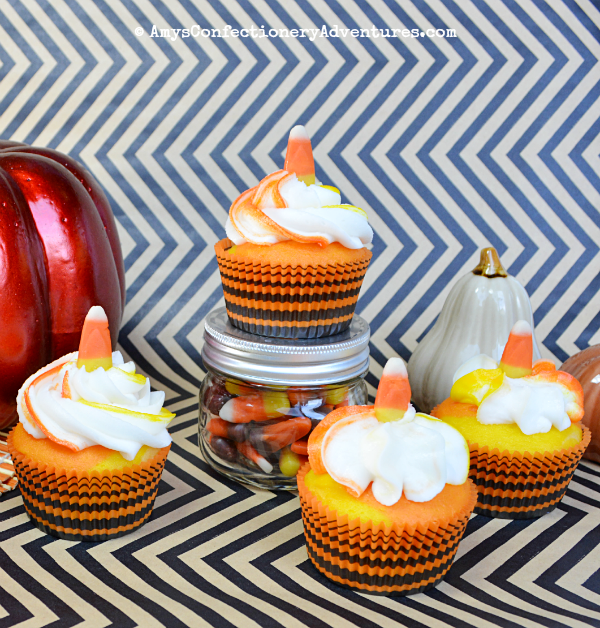 These cupcakes were perfect for my grown up Tea Party, but would also be lovely at a springtime bridal shower, baby shower, or a sophisticated addition to a summertime BBQ. So enjoy and drink up! Earlier this year, my friend’s mom turned 50. She asked for an over the hill cake, but elegant not grotesque. Instead of making a big tombstone cake (an over the hill classic), I decided to do something over the hill inspired. The best way, I decided, was to make a simple white cake with lots of black filigree and a touch a black lace. I also added a pop of purple (my camera hates purple and always make it look blue – ugh), to add just a bit more elegance to the cake. Over the Hill? Nope, Fifty & Fabulous! The cake (again) is my favorite Rich Chocolate Cake frosted in Basic Buttercream and topped with MM Fondant. The filigree is hand piped black royal icing. I used this tutorial for the lace flowers, and this one for the purple fondant flower.